, an eminent historian, was born at Castresin Languedoc, March 25, 1661. His family was originally from Savoy, and is supposed to have removed into France upon embracing the Protestant religion. Philibert de Rapin, his great-grandfather, who was of that persuasion, exposed himself so much to the indignation of the Roman catholics, and particularly to that of the parliament of Toulouse, that his head was struck off in 1563 by a sentence of theirs, at the very time that he came, by the king’s order, to have the treaty of peace registered there. Daniel the historian passes over this fact in silence; and his reason is supposed to have been, that he might exaggerate the disturbances raised by the Huguenots afterwards in the country about Toulouse. 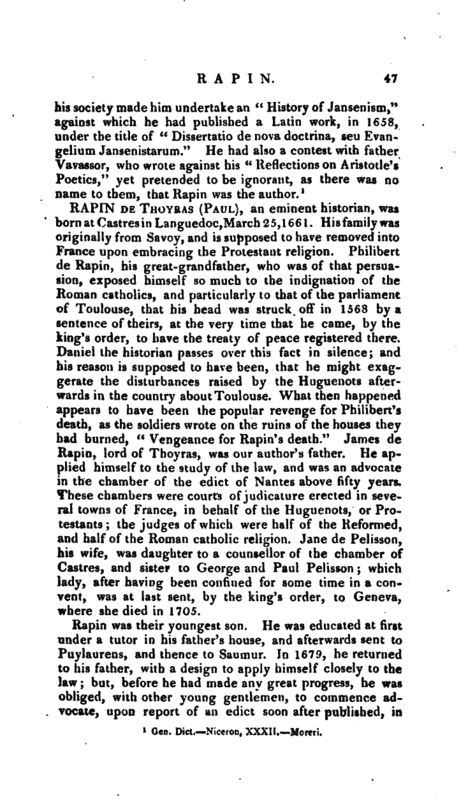 What then happened appears to have been the popular revenge for Philibert’s death, as the soldiers wrote on the ruins of the houses they had burned, “Vengeance for Rapin’s death.” James de Rapin, lord of Thoyras, was our author’s father. He applied himself to the study of the law, and was an advocate in the chamber of the edict of Nantes above fifty years. These chambers were courts of judicature erected in several towns of France, in behalf of the Huguenots, or Protestants; the judges of which were half of the Reformed, and half of the Roman catholic religion. Jane de Pelisson, his wife, was daughter to a counsellor of the chamber of Castres, and sister to George and Paul Pelisson; which lady, after having been Confined for some time in a convent, was at last sent, by the king’s order, to Geneva, where she died in 1705. Rapin was their youngest son. He was educated at first under a tutor in his father’s house, and afterwards sent to Puylaurens, and thence to Saumur. In 1679, he returned to his father, with a design to apply himself closely to the law; but, before he had made any great progress, he was obliged, with other young gentlemen, to commence advocate, upon report of an edict soon after published, in | which it was ordered, that no man should have a doctor’s degree without having studied five years in some university. The same year, the chamber of the edict of Nantes was suppressed, which obliged Rapin’s family to remove to Toulouse: and the state of the Reformed growing every day worse, with his father’s leave he quitted the profession of advocate for that of arms. He had before given what his biographer calls proofs of a military disposition; for he had fought a duel or two, in. which he had acquitted himself very gallantly. His father at first did not grant his request, but gave him such an answer, as served to prolong the time. Rapin, however, advanced so far in his legal progress as to plead one cause, and one only; and then applied himself diligently to mathematics and music, in both which he became a good proficient. In 1685, his father died; and two months after, the edict of Nantes being revoked, Rapin with his mother and brothers retired to a country-house; and, as the persecution in a short time was carried to the greatest height, he and his youngest brother, in 1686, departed for England. He was not long in London, before he was visited by a French abbé of distinguished quality, a friend of his uncle Pelisson, who introduced him to Barrillon, the French ambassador. These gentlemen persuaded him to go to court, assuring him of a favourable reception from the king; but he declined this honour, not knowing what the consequences might be in that very critical state of affairs. His situation indeed was not at all agreeable to him; for he was perpetually pressed, upon the subject of religion, by the French Catholics then in London; and especially by the abbe“, who, though he treated him with the utmost complaisance, always turned the discourse to controversy. Having no hopes of any settlement in England at that time, he went over to Holland, and enlisted in a company of French volunteers, then at Utrecht, under the command of Mr. Rapin, his cousin-german. 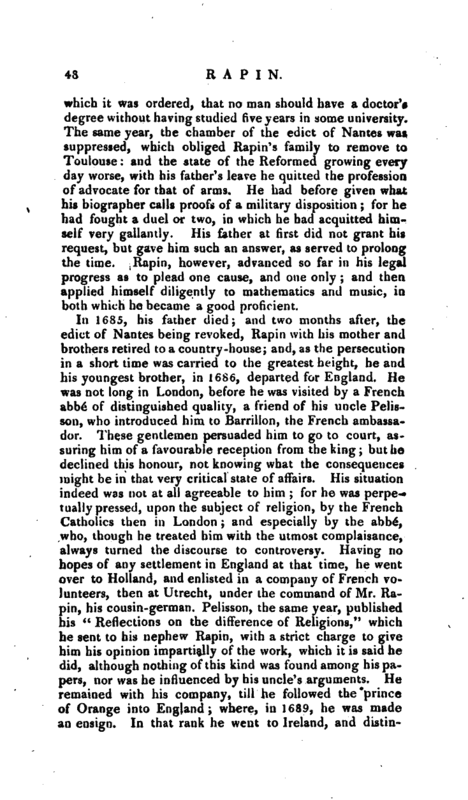 Pelisson, the same year, published his” Reflections on the difference of Religions," which he sent to his nephew Rapin, with a strict charge to give him his opinion impartially of the work, which it is said he did, although nothing of this kind was found among his papers, nor was he influenced by his uncle’s arguments. He remained with his company, till he followed the prince of Orange into England; where, in 1689, he was made an ensign. In that rank he went to Ireland, and | distinguished himself so bravely at the siege of Carrick-fergus, that he was the same year promoted to a lieutenancy. He was also present at the hattle of the Boyne; and, at the siege of Limerick, was shot through the shoulder with a musket-ball. This wound, which was cured very slowly, proved very detrimental to his interest; as it prevented him from attending general Douglas into Flanders, who was very desirous of having him, and could have done him considerable service: he had, however, a company given him. In the end of 1693, he was ordered for England without any reason assigned; but a letter informed him, that he was to be governor to the earl of Portland’s son. Having never bad any thoughts of this kind of employment, he could not imagine to whom he owed the recommendation; but at last found it to be lord Galway. He immediately went to London, and entered upon this charge, losing, however, with it those preferments in the army which several of his fellow-officers soon after attained. All the favour shown him was, that he had leave to resign his commission to his younger brother, who died in 1719, after having been made lieutenant-colonel in a regiment of English dragoons. Indeed the king gave him a pension of 100l. per annum, “till such time as he should provide for him better;” which time never came: and after enjoying this pension during the king’s life, a post of small value was given him in its stead. 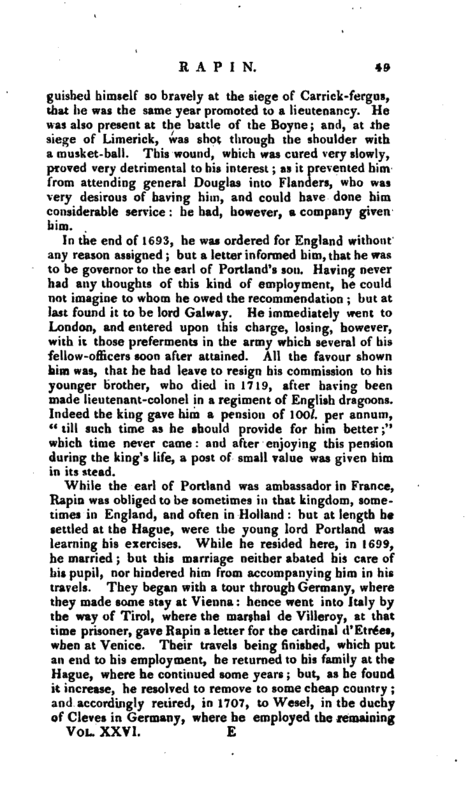 While the earl of Portland was ambassador in France, Rapin was obliged to be sometimes in that kingdom, sometimes in England, and often in Holland: but at length he settled at the Hague, were the young lord Portland was learning his exercises. While he resided here, in 1699, he married; but this marriage neither abated his care of his pupil, nor hindered him from accompanying him in his travels. They began with a tour through Germany, where they made some stay at Vienna: hence went into Italy by the way of Tirol, where the marshal de Villeroy, at that time prisoner, gave Rapin a letter for the cardinal d’Etrees, when at Venice. Their travels being finished, which put an end to his employment, he returned to his family at the Hague, where he continued some years; but, as he found it increase, he resolved to remove to some cheap country; and accordingly retired, in 1707, to Wesel, in the duchy of Cleves in Germany, where he employed the remaining | years of his life in writing fche “History of England.” Though his constitution was strong, yet seventeen years application (for so long he was in composing this history) entirely ruined it. About three years before his death, he found himself exhausted, and often felt great pains in the stomach: and at length a fever, with an oppression in his breast, carried him off, after a week’s illness, May 16, 1725. He left one son and six daughters. He was naturally of a serious temper, although no enemy to mirth: he loved music, and was skilled, as we have said, in mathematics, especially in the art of fortification. He was master of the Italian, Spanish, and English languages; and had also a very competent knowledge of the Greek and Latin. He spent all his leisure hours in reading and conversing with men of learning and information. He lived to publish the eighth volume of his history, which ends with the death of Charles I. The two remaining volumes, which bring the history down to the proclamation of William and Mary, came out in 1724. They were printed at the Hague in quarto; and have twice been translated into English; by the Rev. Nicholas Tindal, M. A. first in octavo, then, much improved in style, in folio; and by John Kelly of the Inner Temple, esq. in two vols. folio. Tindal has given a Continuation of Rapin’s history to 1760, and added useful notes to the whole. When Rapin first set about this work, it was not his intention to write a complete history of England; but curiosity and much leisure led him on from one step to another, till he came to the reign of Henry II. ; and then, when he was upon the point of stopping, an unexpected assistance came forth, which not only induced him to continue his history, but to do it in a more full and particular manner than at first he intended. 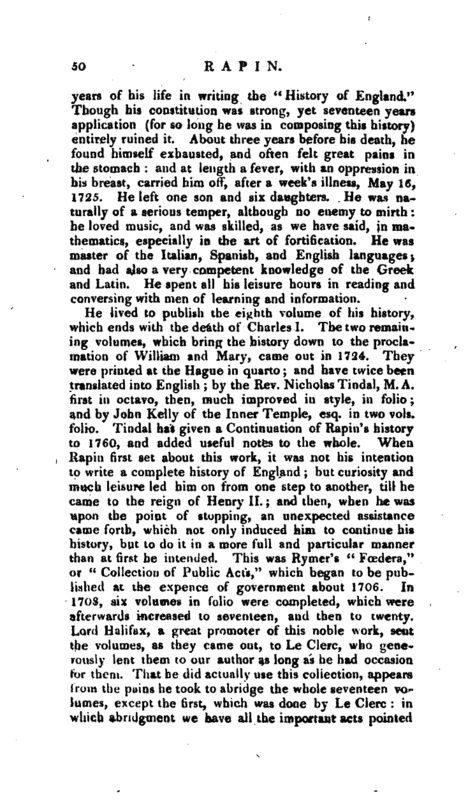 This was Rymer’s “Fœdera,” or “Collection of Public Acts,” which began to be published at the expence of government about 1706. In 1708, six volumes in folio were completed, which were afterwards increased to seventeen, and then to twenty. Lord Halifax, a great promoter of this noble work, sent the volumes, as they came out, to Le Clerc, who generously lent them to our author as long as he had occasion for them. That he did actually use this collection, appears from the pains he took to abridge the whole seventeen volumes, except the first, which was done by Le Clerc: in which abridgment we have all the important acts pointed | ut, a well-connected series of events to which they relate, and the use to be made of them in clearing up the history of England. This abstract lies scattered up and down in the several volumes of Le Clerc’s “Bibliotheque Choisie;” and was thence translated and published in English, in 1727, in four volumes octavo, with portraits. 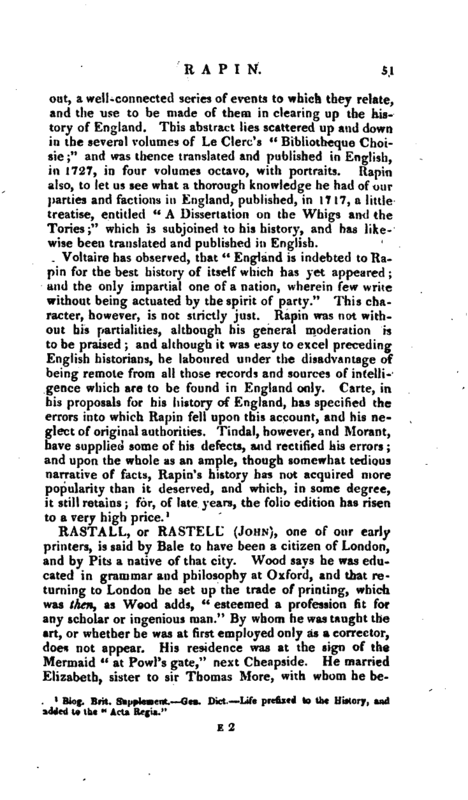 Rapin also, to let us see what a thorough knowledge he had of our parties and factions in England, published, in 1717, a little treatise, entitled “A Dissertation on the Whigs and the Tories;” which is subjoined to his history, and has likewise been translated and published in English.